Every time I go on vacation I come back with tons of souvenirs. I go to Disneyland pretty often and I always manage to come home with something new. This time wasn't any different. 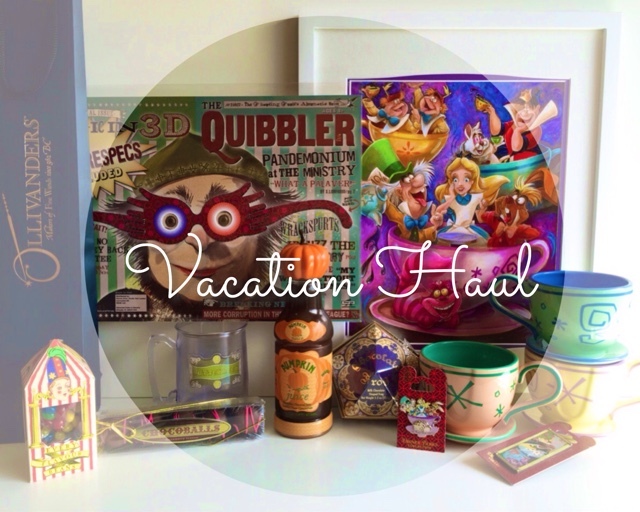 I also got a chance to visit the Wizarding World of Harry Potter for the first time so of course I had to pick up some items from there too. Starting off with Disneyland, this trip I didn't get too many things but I managed to purchased everything Alice in Wonderland which I'm not mad about. 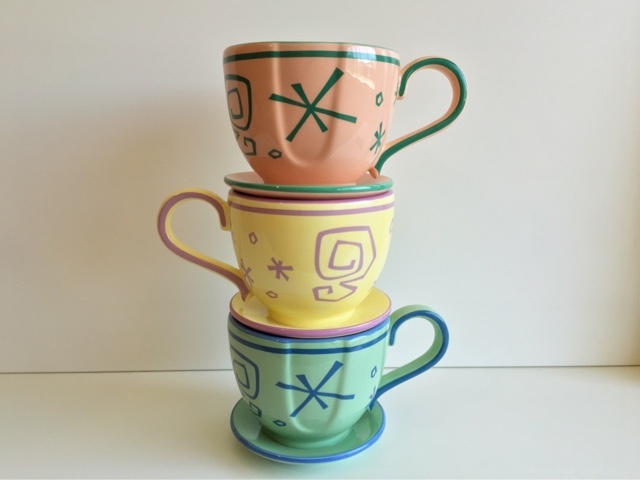 A week after my last trip to Disneyland they released these super adorable tea cup mugs and I was really bummed that they didn't have them while I was there. This trip I knew that I was going to get myself at least one since they are a bit pricier than their usual mugs. Disneyland came out with a total of four of these mugs all different colors; peach, mint, yellow, and a purplish pink. While I was there I decided I couldn't just buy one that I needed at least two then two became three and that almost lead to me buying all four but I stopped myself at three since I wasn't too fond of the last one. Clearly I had to get the peach mug which has a dark minty color inside, the mint mug with blue, and lastly the yellow with a very pretty lavender color. I think they are so cute and I've already started using them. I do mainly have them in my room for display though since it goes perfectly with my Alice in Wonderland collection shelf I have going on. Next I finally purchased my first art portrait from Disneyland. This was kind of a big moment for me ha ha. 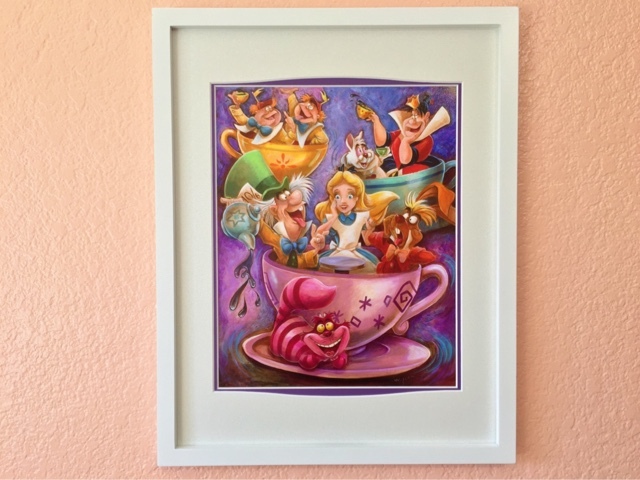 I knew I wanted to get a large Alice in Wonderland art print since the ones I own are generally 5x7. I had seen so many beautiful ones in the past but never got down to buying one so this trip I had my mind set that I was going to get myself one, plus they aren't very pricey either. This trip I didn't see a huge variety in Alice prints like I had in the past but this here was the prettiest one. I was a bit hesitant at first but I'm so happy I decided to take it. I love that it has most of the characters in it and that they are all inside tea cups! I bought a frame for it and already have it hanging in my room and it looks perfect. These last items I purchased at Disneyland was kind of a impulse buy. Every single time I go to Disneyland I always see them and I'm constantly eyeing them! 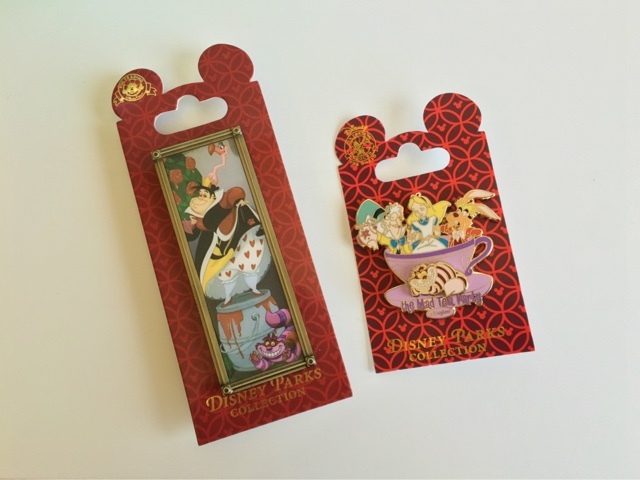 While I was inside one of the shops looking to see if they had released any new pins I once again ran into them. Of course I thought they were beautiful I just don't really know what to do with pins since I don't ever wear them. I decided to just buy them since I will probably regret it one day when they're gone and I'm pretty happy I did. The Queen of Hearts is apart of a 4 pin series of the Disney Villains similar to the Haunted Mansion stretched portraits. It's so cute and different. 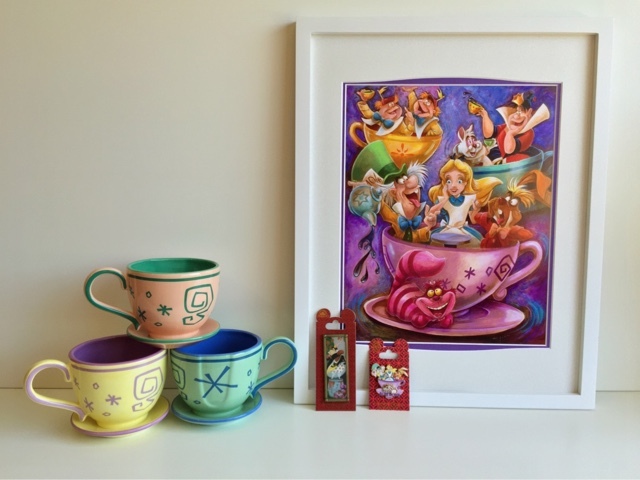 The tea cup pin with Alice, Hatter, March Hare and Cheshire Cat is so fun. I love how its more of a 3D type pin and its also very similar to the portrait I bought. Now for Universal Studios or should I say the Wizarding World of Harry Potter. 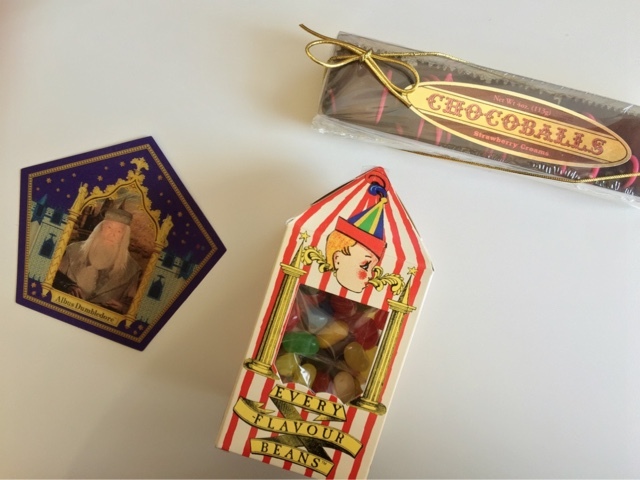 I got a lot of candy souvenirs rather than actual keepsakes. I felt like they were kind of lacking in that department. They did have tons of clothing but that isn't something I was really interested in. So I am going to start with the candies I got. 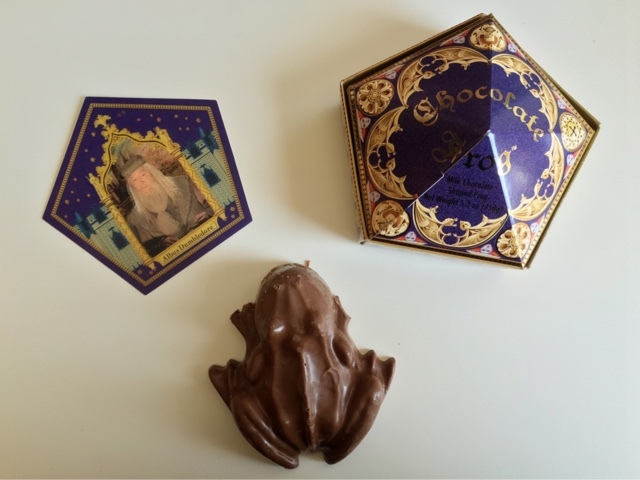 Rudy and I each got one of their chocolate frogs. I kept my eye on it for a few minutes and it never jumped... I mainly got mine to save and have displayed somewhere but I'm sure I'll eventually open it up to remove the chocolate before it goes bad. Its so cool that they even come with a card inside just the like the movie. Rudy already opened his the day we got home and the card he got was of Dumbledore. I have yet to open mine so I don't know which card I got but I am very curious to find out. I knew I had to pick up a box of their Bertie Bott's Every Flavour Beans. I really wanted to get the candies that they showed in the movies which always left me wanting to try them. 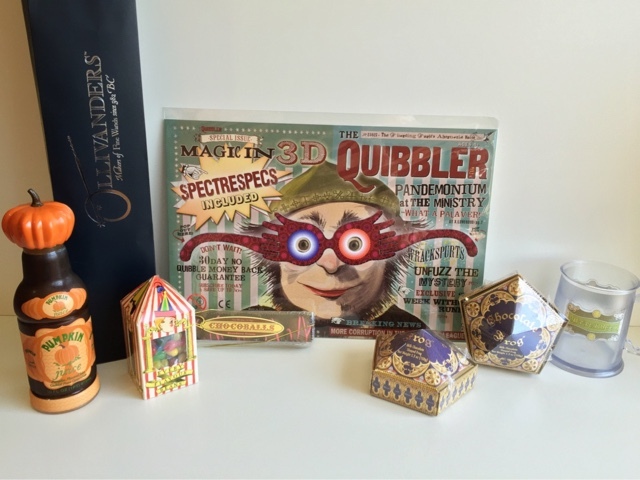 Once again I got this to display especially since the packaging is so cute and reminds me of a circus. I will admit I'm also kind of scared to even try it, I don't want to eat a booger flavored one... Last of the candies I saw that they had these truffle looking chocolates that have a strawberry cream inside. These are one of my favorite kinds of chocolates, the ones with creams inside so I didn't even think twice when I grabbed this one. I can't wait to try it out. 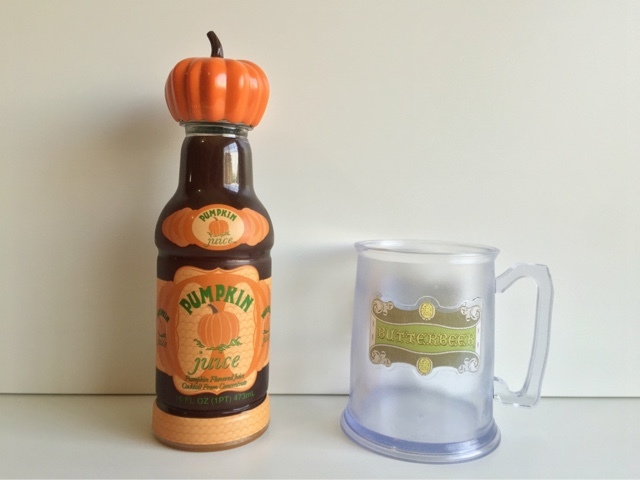 Rudy really wanted to try their pumpkin juice. I'm not a huge fan of pumpkin so if I decide to eat something pumpkin it can't be too overwhelming in taste. Once we got back home from our trip he opened it up to try and he really enjoyed it. I took a sip and it wasn't bad but just not something I would enjoy drinking. Just the idea of drinking something that taste like spices throws me off. I love the bottle however and I am also going to save that not sure for what ha ha but I can't bring myself to throw it away. Its a cute keepsake just like this next item. Being at Hogwarts of course we had to try their famous ButterBeers! Rudy got two one when we first arrived then one just before we left the park. They give you the option to get it as an icee which was delicious and they also ask if you'd like it in a souvenir cup. Clearly we had to at least get one of those cups to take home. The Butterbeer was really good unlike anything I have ever tried before. I am very satisfied with it and happy we finally got to try it out. I was very Luna Lovegood inspired when we went to the park with wearing the Luna shirt my friend made me along with the Spectrespec sunglasses that everyone was loving! Luna is my absolute favorite character! Once I saw this cute print I knew I had to get it. In the movie Luna is handing these out but in the movie it's an actual newspaper or magazine. 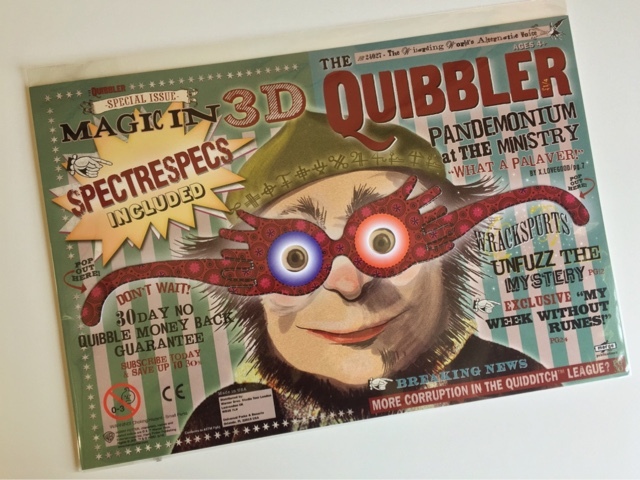 Inside it comes with you very own pair of spectrespecs (paper version). I was very surprised that this was the only way you could get spectrespecs there which was probably why everyone was so interested in my actual pair. I am planning on framing this and hanging it in my room. Finally for the last items of this haul. Since this was our very first time visiting Hogwarts it was a must that Rudy and I got our very own wands! This was so exciting for me, I couldn't wait to see which wand was going to 'choose' me. The way they do it at the park, you wait in line to meet the wand keeper. 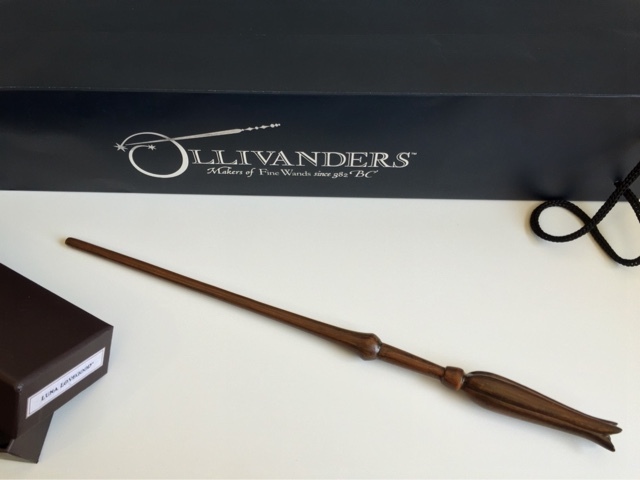 There they will do a little show for you and he or she will pick someone out of the crown at random to get him or her fitted for their wand. Once that is over you go into the wand shop were you can choose any wands you'd like. 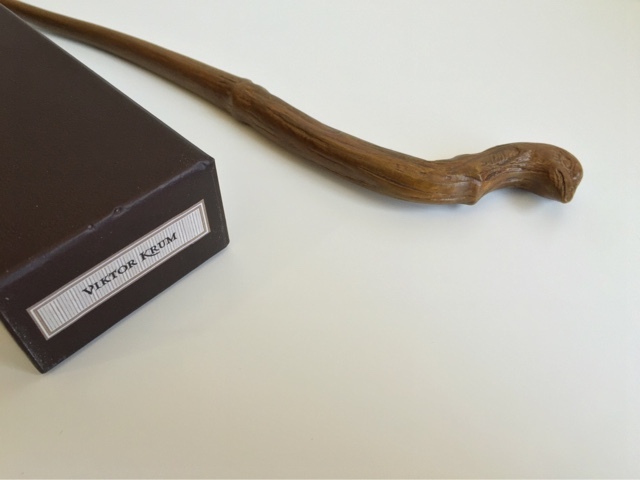 You can choose from some of the famous ones such as Harry, Dumbledore, Ron or you can also choose some that that are no name ones. Those are more unique. I didn't know how to go about it or let alone where to start so I walked up to a wall in search for my wand and the first one I saw was of Luna Lovegood herself. I took that as a sign and picked that one up for myself. I felt that wand was calling to me which was why I was lead there, ha ha probably a little strange. Rudy took longer than me to find his wand but at the end he decided to pick up the wand of Viktor Krum. 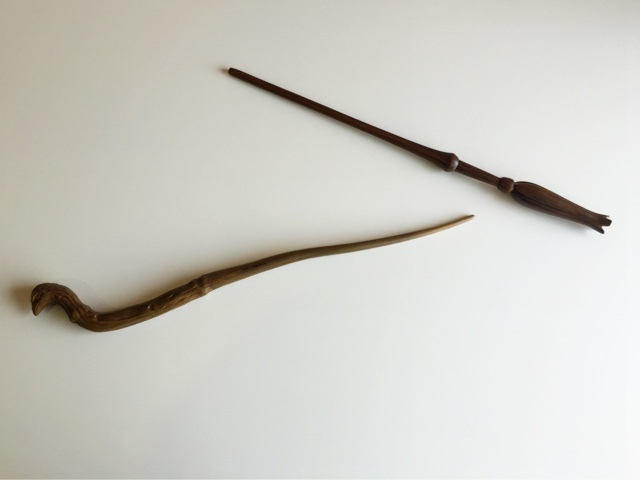 I think both wands are beautiful and such a great souvenir to take home. This is probably my favorite item I got from this trip. 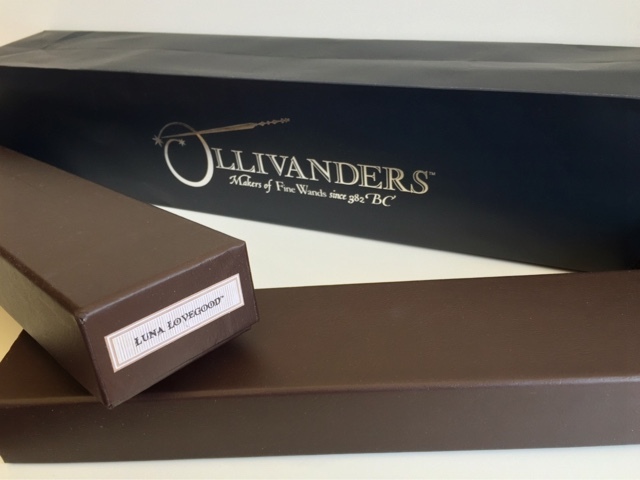 If any of you plan on visiting the Wizarding World a wand is probably the one thing I'd recommend you getting. So much cuteness in one post! I love your wand, I can't wait to see what Ricky and I get. I really like how you stacked the tea cups they look really cute like that I might need to buy some more. Thank you! The cups were too cute to pass up. I can't wait to see which wands you guys get!